I trust the AD9850 readout, because I just finished zero-beating it against the GPS-locked 10 MHz frequency reference: it’s dead on. The scope’s frequency measurement is clearly out of its depth at this resolution. The “user interface” doesn’t amount to much. 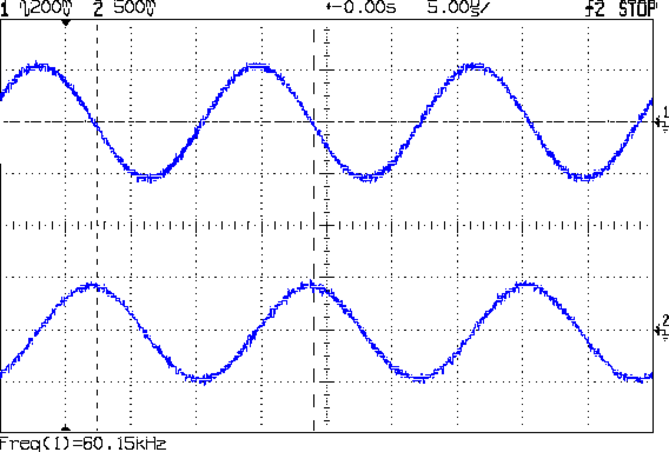 The DDS starts at 60.000 kHz, as defined by a program constant. Push the joystick left-right to step by 0.1 Hz (actually, multiples of 0.0291 Hz, so either 0.087 or 0.116 Hz, whichever makes the answer come out closer to the next multiple of 0.1 Hz). Push it up-down to step by 1.0 Hz (insert similar handwaving here). Push the button inward to reset to 60.000 kHz. 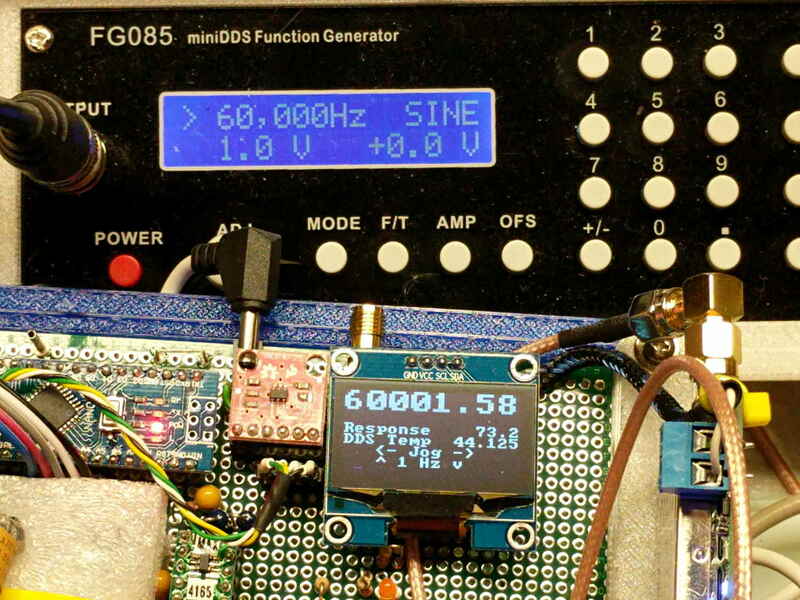 The OLED displays the frequency (in big digits), the output of the log amplifier (which isn’t hooked up here) in dB (over 4 μV), the DDS clock oscillator temperature, and a few lines of static prompting. The camera shutter blanked the last line, which should read “Button = reset”. There’s no amplitude adjustment, other than the DDS current-control twiddlepot and the buffer amp’s gain-setting jumpers, but I (think I can) gimmick up an adequate inductive kicker for the fake preamp antenna circuit. Not much to look at, but now I can (manually) probe the frequency response of the 60 kHz preamp with sufficient resolution to figure out if / how the tuning fork resonator filter behaves.